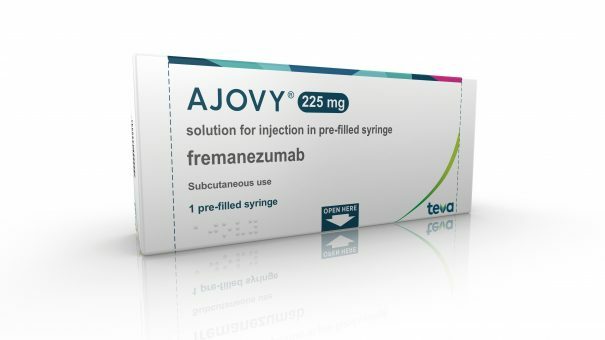 Teva’s migraine drug Ajovy (fremanezumab) has been approved in Europe, taking on rivals from the same class from Novartis and Eli Lilly. Novartis already has Aimovig (erenumab) approved in Europe, along with Eli Lilly’s Emgality (galcanezumab), with both drugs available as monthly injections. With Ajovy, which is also from the calcitonin gene-related peptide (CGRP) class, injections are given either monthly or quarterly. It is also an important drug for Teva, which is struggling to pay off debts following the $40.5 billion takeover of Allergan’s generic drug business Actavis in 2016. The Israel-based company is in need of new revenues, and Ajovy is expected to bring in around $500 million a year peak sales. European approval is based on two pivotal phase 3 clinical trials that enrolled patients with disabling migraine and studied Ajovy as a prophylactic treatment for migraine in adults. In these trials, patients treated with Ajovy had a significantly greater reduction in migraine days compared to placebo. Messoud Ashina, professor of neurology in the Faculty of Health and Medical Sciences, University of Copenhagen, Denmark, stated: “Migraine is a debilitating neurological disease which can have a substantial impact on quality of life. “The disease is most common between the ages of 25 and 55 meaning that it strikes during the most productive years, disrupting patients’ personal and professional lives. The FDA approved Ajovy as a preventive treatment for migraine in adults in September last year, and additional regulatory filings are underway with other health authorities.